Drax is right. Similarly, there are two types of movie fans in the universe: those who think Guardians of the Galaxy Vol. 2 is a good film, and those who do not. In March of 2017, one of the most polarizing MCU films to date hit theaters, as director James Gunn’s crew of wisecracking misfits were challenged by a new threat known as Ego. Ego, an ancient celestial who quite literally embodied an entire planet (and David Hasselhoff for a few seconds), was one of the most powerful villains the MCU had seen. In order to defeat him, the Guardians needed to put their personal quarrels aside and work together. SPOILER ALERT! This review will contain spoilers for Guardians of the Galaxy Vol. 2. Proceed with caution. All the Guardians from the first film return to this one, including a new and improved(?) Groot (he’s a baby now). Nearly every actor improves on their last performance, most specifically Chris Pratt as Peter Quill/Star-Lord and Michael Rooker and Yondu. Between Peter’s rollercoaster of finally finding his father, only to discover he’s who implanted a fatal tumor in his beloved mother, and Yondu’s experience being ostracized and betrayed by the Ravagers, to ending up giving his life for Peter’s, Pratt and Rooker were truly able to show off their acting capacity in ways many moviegoers had not seen. 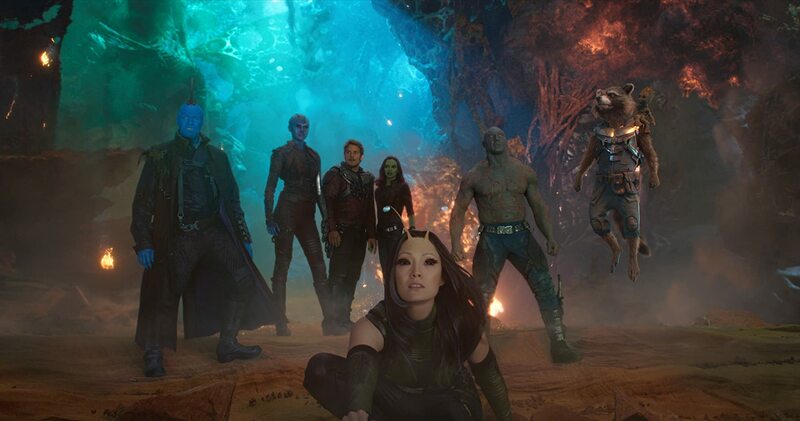 Compile that with the spectacular new additions of Kurt Russell as Ego and Pom Klementieff as Mantis, and you have a great showing by every member of the cast. This film is action-packed from start to finish, but it does have some issues in the plot. Yondu, Rocket, and Peter all have separate intertwining stories that hold their own and progress the plot with good pacing and strong dialogue. However, there’s a separate storyline that just doesn’t seem to fit with the rest of the movie: the Sovereign. While the Sovereign are an enjoyable part of the film, their inclusion simply doesn’t mesh the way the other plot lines do. 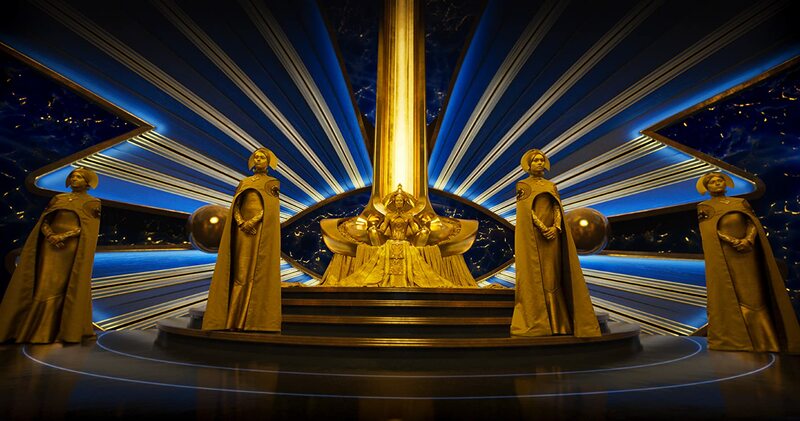 Now, do they serve a greater purpose in establishing Adam Warlock’s origins for Guardians of the Galaxy Vol. 3? Sure. But this isn’t Vol. 3, this is Vol. 2. Perhaps the Sovereign’s story will blend well after we see how Vol. 3 plays out, but as for this specific story, they simply don’t fit. That being said, the rest of the movie has a thrilling story. Right when it all seems to be predictable for the rest of the film, Ego drops a bomb on Peter and reveals that it was he who gave Meredith Quill the cancer that would go on to kill her right before Peter’s eyes. This plot twist alone will shake an audience member to the core, and remains one of the strongest we’ve seen in the MCU thus far. A review of this film would be incomplete without touching on the spectacular behind-the-scenes efforts. James Gunn’s directing and writing shines, as his eccentric, quirky personality is truly brought to life in the characters. Gunn is somewhat of a mad scientist when it comes to the Guardians movies, always taking them in unexpected directions that somehow work out. Despite Gunn’s magnificent directing, there is one element of the production that outshines all others: special effects. Nominated for Best Achievement in Visual Effects at the Oscars, the film displays vibrant usage of color and intricate, stunning special effects that captivate the viewer. Ego’s planet is truly a feat of visual effects (not to mention Ego himself. How did they make Kurt Russell 20 years younger in that opening scene?). Yondu’s Ravager funeral is one of the most emotional moments in the MCU yet, and the beautiful colors and effects of that scene give perhaps the most brilliant shots of the film. All in all, Guardians of the Galaxy Vol. 2 is a thrilling and emotional sequel to a similar predecessor. James Gunn delivered yet another spectacular story, and despite minor issues, the film went on to make upwards of $850 million in box office revenue. Cue the dancing, Baby Groot.